Michelle Obama wears Head Scarf while touring Indonesian Mosque, has she gone too far? This morning in Indonesia, President Barack Obama and First Lady Michelle Obama took a tour of Istiqlal Mosque in Jakarta. Michelle has been very respectful of the Indonesian culture while on this trip. Yesterday, when in a dress, Michelle chose to also wear loose-fitting trousers, covering her legs. Today, Mrs. Obama continues to honor the Indonesian traditions by wearing a loose-fitting pants suit, and even decided to throw on a head scarf! While touring the mosque, Michelle Obama wore a yellow, matte jersey Stephen Burrows pant suit (previously seen worn this past July). She paired this suit with a custom head scarf, or hijab. However, Michelle’s head scarf has a little bit of stylish flair to spices up her look. This silk Prova scarf displays an animal print design and features 3 layers of fringing – teal material, gunmetal glass-beads and pale yellow pom-poms. With this ensemble, the first lady also wore stocking feet. Wow! I can understand the terms of “respecting” a culture, but if she was definitely not required to wear a head scarf. I do recall former First Lady Laura Bush wearing a head scarf at one point during the Bush administration, although it was presented to her as a gift. Michelle’s designer scarf was definitely not a gift, and while I do agree with her respect for the Indonesian culture, the hijab takes this just a little too far. When students at Texas A&M University were asked what they thought about this head scarf, there were mixed emotions. Amber McAlister, a sophomore student, said that her fashion choices should be of no importance to Americans, but rather, we should only focus on her political views. Brett Parsons, a senior at A&M, disagreed by stating, “Her outfits represent America when she is overseas, and I don’t think she should have worn that. She can respect their customs, but she doesn’t have to join in.” Another senior, Lauren Stinson, also believed Mrs. Obama was in the wrong by wearing this head scarf. 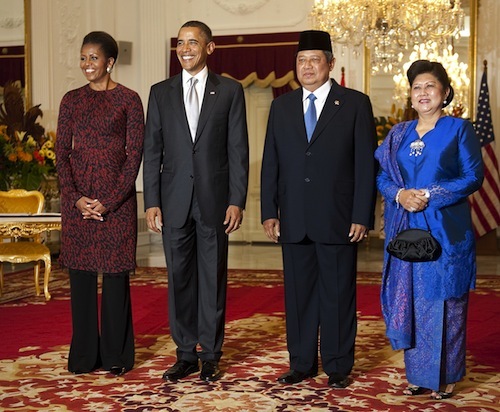 Do you agree with Michelle Obama dressing in Indonesian customs? Yes, she has showed she respects their culture, but his this too much? Earlier today, President and First Lady Obama arrived in Jakarta, Indonesia, the world’s largest democracy, for a three-day visit. They began their day with a meeting of President Susilo Bambang Yudhoyono and First Lady Ani Yudhoyono of Indonesia during an official arrival ceremony held at the State Palace Complex Istana Merdeka. After this meeting, the two presidents are expected to share a conversation about security and economic issues. Any ideas on what they first ladies will discuss? For this first appearance in Indonesia, the lady looks magnificently stunning, while still respectful of the Indonesian culture. Michelle was dressed in a black and red patterned dress with pleating at the center of the waistline, a slenderizing look. Under this dress, she wore a pair of loose fitting, black trousers. If Michelle were wearing this garment in America, she would simply wear the dress alone; however, I think this pairing of pants with dresses is quite chic. I, myself, would be too afraid to wear this avant-garde fashion on the streets, but Michelle is much more daring with her style than I am. Hopefully, Michelle will bring this look back to the states! What do you think about it? As far as President Obama goes, he definitely let me down with his outfit. He did not change from the same suit he was wearing this morning. Sadly, he did not even change his tie. His golden beige tie matched Michelle’s dress this morning, and it is a shame he did not switch into a red tie to match Mrs. Obama once again. After all, President Yudhoyono even chose a tie to match his wife’s blue dress. After an event filled three days in India, President Barack Obama and First Lady Michelle Obama boarded Air Force One this morning in route to Indonesia. The president and first lady are on a ten day Asia tour which includes these visits in India and Indonesia and is to be followed by stops in South Korea and Japan. 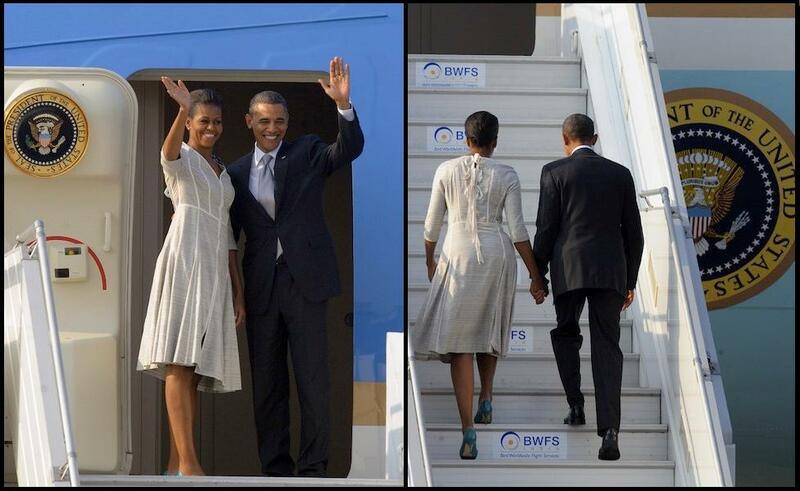 When boarding Air Force One, Mrs. Obama was dressed in an intricately designed beige frock. This dress featured lateral seaming, three quarter-length, raglan sleeves, and a lace up back. What’s the word for this dress? Slimming! Raglan sleeves give the shoulder frame a narrow appearance, while lateral seaming creates a long and lean silhouette for any figure. 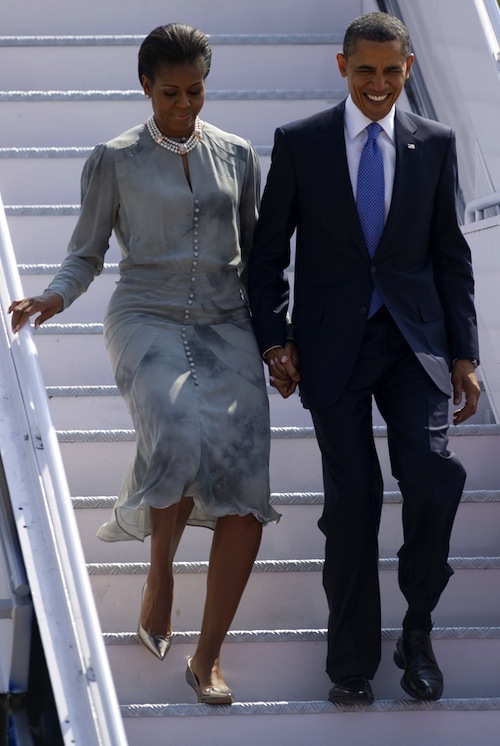 This dress looks fabulous on Michelle, as well as comfortable for a plane ride. She accented this simple colored dress by adding her bright, floral Alexis Bittar pin (available here), also worn yesterday, and a pair of matching kitten heels. I usually do not mention the fashion choices of President Obama, as he normally sticks with his simple business suits for tours such as this. However, take a look at the president’s tie this morning. Perhaps he wanted to match Michelle today? Tonight in India, President Barack Obama and First Lady Michelle Obama are attending the Indian State Dinner in New Delhi. The president and first lady are the honored guests of Pratibha Patil, the President of India, and her husband, Devisingh Patil. For this state dinner event, Michelle chose to wear a floor-length, sparkling silver skirt paired with a golden blouse and belt. Mrs. Obama must know her fashion, because this mix of metallics is one of the hottest fashion trends this fall season. 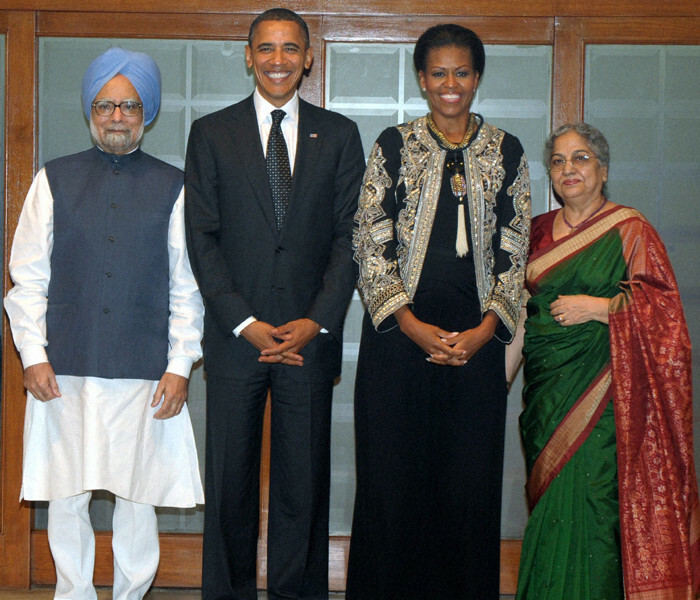 In addition to Michelle’s stunning outfit, notice how the President of India is also dressed in gold. Did the two women plan this? After taking part in a Diwali celebration, dancing with some children and then, speaking at a university in India yesterday, President Barack Obama and First Lady Michelle Obama paid a visit to the residence of Prime Minister Manmohan Singh and First Lady Gursharan Kaur of India. The two couples dined together after the Prime Minister and President Obama held a joint press conference at Hyderabad House in New Delhi, India. What Michelle Obama wore to this press conference and dinner has everyone talking! The first lady chose to dress in a garment which definitely shows that she is embracing the Indian culture. Mrs. Obama wore a simple, black top and full, ankle-length skirt, She paired this look with a Dries Van Noten jacket (seen here) and a gold and silver tassel necklace, designed by Ranjana Khan. Surprisingly enough, the jacket does not at all look like it is from the Indian culture when paired with different articles of clothing, as seen in the runway shot. However, the way Michelle styled her ensemble, it looks as though it was purchased in India. The tassel definitely adds that extra touch of Indian culture, perhaps too much? Yesterday, I noted that I loved Michelle’s ability to be herself wherever she goes, but was I too quick to pay her that compliment? Is this outfit “Michelle”? President and Michelle Obama were very active yesterday in India, their second day on the couple’s tour of the country, and Michelle’s outfit changes testify to it. 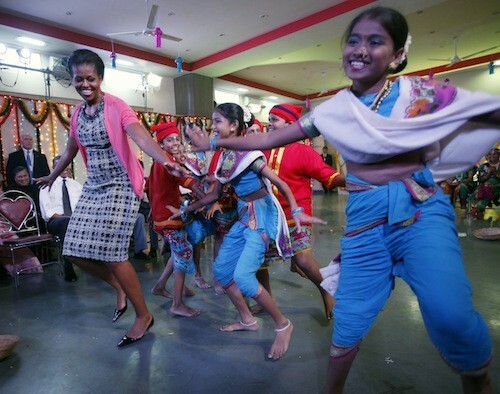 The president and first lady began their day at Holy Name High School, located in Mumbai, where they participated in a Diwali celebration, which included dancing with a group of children. Take a look at the video below to view Michelle Obama dancing, and even see President Obama join in at the end of the video! For this exciting event, Michelle was dressed in a black and white, textured dress paired with a bright pink cardigan. With this ensemble, she wore a chunky Tropical Punch necklace, designed once again by Ericson Beamon. Michelle has been wearing quite a few pieces by this designer lately; perhaps he is becoming one of her favorite designers? After this fun activity, President Obama and Michelle visited St. Xavier’s College in New Delhi where Mrs. Obama delivered an address to a crowd of students. For this speech, Michelle exchanged her pink cardigan for a black and white blazer, a perfect match to her dress. She then cinched in her upper torso with a skinny black belt. Michelle looks great in this modern twist of a dress suit. Finally, after their duties as president and first lady concluded, the couple took a stroll, hand in hand, in New Delhi, touring Humayun’s Tomb. Michelle changed again for this casual afternoon walk. This time, she wore a Paul Som custom, pastel blue dress with detailed pleating at the waist. She added a matching cardigan with an embellished brooch to complete this outfit. 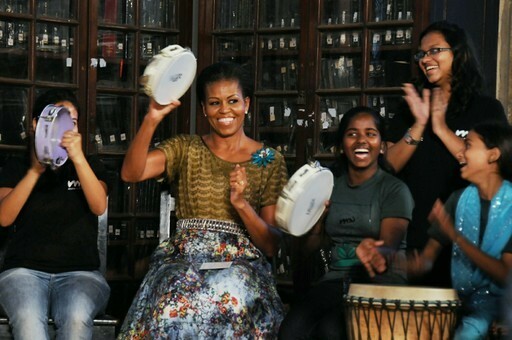 It is nice to see Michelle dancing around and not afraid to completely be herself, even when in another country. These two ensembles show that Michelle likes the classic styles with a bit of pizazz thrown into the mix, such as her bright cardigan and chunky necklace. This first lady has a wardrobe with a wide variety! What do you think about the Mrs. Obama’s fashion choices? Yesterday afternoon, President Barack Obama and First Lady Michelle Obama departed the White House in pursuit of India. The couple will begin their tour of India today in Mumbai, honoring the victims of the terrorist attacks. 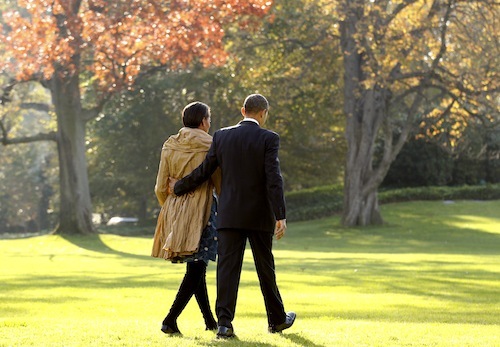 Upon departure yesterday, Michelle Obama was dressed in a blue, floral dress, khaki coat. With this ensemble she wore black tights and knee-high boots, a staple this fall season. What do you think about this casual look on Michelle? In my opinion, this outfit looks great on Michelle! Khaki is the perfect color for the change of seasons. Her dress is also great. The ruching of material in the middle of this dress accentuates Mrs. Obama’s waistline, making it appear smaller to the eye. After visiting Mumbai, the president and first lady will be making many other stops, for both business and pleasure, including a few dinners with Prime Minister Manmohan Singh and First Lady Gursharan Kaur of India. The first couple will even be joining the Prime Minister and his wife at a state dinner in Delhi on Monday night. Perhaps Michelle Obama will choose to honor the Indian culture by wearing another dress by Naeem Khan as she did at a previous state dinner held at the White House (seen here). What do you think? According to The Wall Street Journal, Michelle “has three or four amazing other dresses” designed by Naeem Khan. Any predictions on what Michelle will be wearing this week?